The above info came from Kirbyfan105, and was edited by yours truly (contact me). The image came from usamimi. 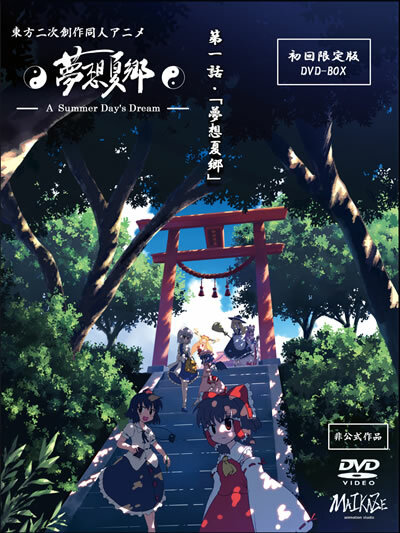 The Touhou Anime Project is an anime created by Studio Maikaze that is based on the Touhou Project series of Doujin games produced by Twilight Frontier and Team Shanghai Alice. The Touhou series is popular with fans for its large cast of characters (including anime girls) and various styles of music. The next day, after Reimu Hakurei, the shrine maiden, and guardian of the border of the fantasy land of Gensokyo sends her acquaintance, an oni named Suika Ibuki, out to run an errand for her, she immediately notices that her donation box is missing! Realizing that her donation box may have been stolen, Reimu reluctantly turns to the photographer Tengu Aya Shameimaru, who brings the sorceress Marisa Kirisame, a friend of Reimu's, with her, and goes to the Scarlet Devil Mansion, suspecting Patchouli Knowledge, the keeper of its library, the Voile Library, of being her donation box's theft. However, Patchouli doesn't actually seem to be the culprit, as she has been looking for her missing books all that time. And that's not all; a supply of tea and food supplies kept by Remilia Scarlet's head maid, Sakuya Izayoi, also went missing as well. Once Reimu realizes that, she decides that the problem is just another incident in Gensokyo. What's going on behind the disappearance of Reimu's donation box, Patchouli's books, and Sakuya's tea and food supplies? Who or what and where is the real culprit behind that problem? The above description came from Kirbyfan105, and was edited by yours truly (contact me).